There is a lot of excitement about a new opal find in the Welo (sometimes spelled Wello) region of Ethiopia. 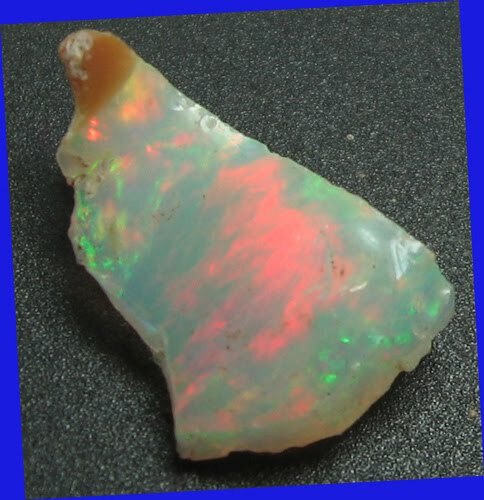 It was discovered in 2008 and is considered the most stable opal found in that country. Opal from other areas of Ethiopia is often very beautiful but has a reputation for being unstable (prone to cracking or crazing). This Welo opal takes a little patience to cut properly, but once cut has proven to be every bit as stable as Australian opal. The fire is generally very bright, usually 4 to 5 on the 5 point brightness scale! They display the full spectrum of colors with red being very prevalent. They also display a wide range of fire patterns and base colors. 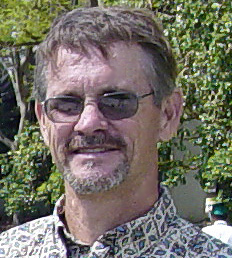 If you look closely at the opal pictured, it shows an unique feature sometimes seen in Welo opals. It shows an internal cellular pattern sometimes called honeycomb. This structure is apart from the base color or the fire pattern. You'll also notice that it has a bi-colored base, being amber colored on the right side and translucent milky white on the other side. 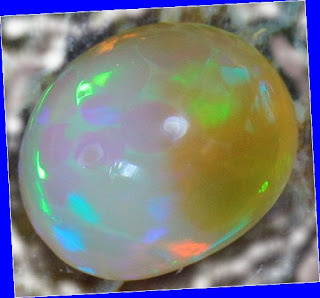 The opal material from Welo is usually hydrophane, which basically means that it can absorb a lot of water. When dry hydrophane is soaked in water, it causes the base color to clear up...sometimes highlighting the play-of-color, sometimes making it vanish! If soaked in water, it can take from a few hours to two weeks to completely dry out and return to it original state. Do not try and accelerate the drying by any artificial means like a lamp, for it could cause cracking. The price of this opal has risen dramatically and well may continue to do so. The Ethi opian government has taken control of the mines and is controlling most all of the material coming onto the market now. On the right is a picture of a piece of Welo opal rough. Anyone who loves and appreciates opals is sure to fall in love with Welo opals. They can be mesmerizing! The colors can be almost unbelievably bright. They show an endless variety of base colors, patterns and colors. Hi there! I could have sworn I've been to this site before but after checking through some of the post I realized it's new to me. Nonetheless, I'm definitely glad I found it and I'll be book-marking and checking back often!